Getting rid of old furniture like couches, love seats, tables, chairs, desks and dressers can be a real pain. For most people, the thought of going through the process of trying to remove furniture, or find someone that will, is enough to deter them from doing anything all together. To remove furniture on your own, most times you’d have to rent or borrow a truck big enough to fit the furniture you want to get rid of. That’s a task in itself. Next, if you’re able to find a truck that is, you’ll have to find the man power to help you load and unload the furniture. 9 times out of 10 you’ll have to pay for that one too. If you are able to get all those moving parts working together, next you just have to find a place to dispose of the items. I know, it’s a process. For some, it’s just easier to keep the old furniture. Rather than going through the painful process of finding a way to remove it. So instead of nice new furniture in your home, you just stick with the old. It’s the easier way.. I guess. For the many of you out there that hate the thought of trying to figure out this game of removing your own furniture, I have the answer to all your problems. The one and only Junk Bucket! 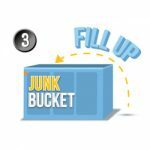 The Junk Bucket is the number one dumpster for household use. Most dumpsters are too big, too bulky, too ugly and far too expensive to have put on your property. Especially for only getting rid of some furniture or other household items. The Junk Bucket Dumpsters are non of these things. 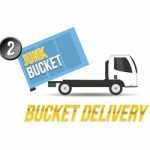 Junk Buckets are sleek, in order to fit in your driveway, affordable for home owners, and best of all, they are pleasing to the eye. This way you can make your neighbors jealous of your dumpster and the new furniture you’re bringing in. 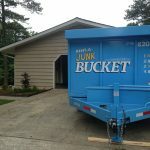 When you rent a Junk Bucket household dumpster to remove your furniture, all the issues that you had with trying to get rid of your junk is gone. With a Junk Bucket in your driveway or side yard, you can work at your own pace, for as long as you like. You can throw away ANYTHING in your home you want to get rid of, and best of all, when you’re done loading up the dumpster, your job is done. You wont have to worry about disposing of anything! 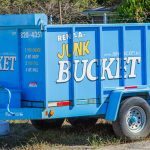 Renting a Junk Bucket for your home is simple. 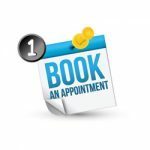 All you have to do is pick up the phone and call us, or even book your appointment online. Once you have narrowed down a day and time, your own person Junk Bucket will be dropped at that time. Once you are done filling it with your household junk and furniture, you give us a call and we come an pick it back up. It’s really THAT SIMPLE. 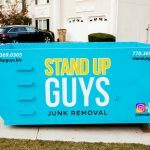 The Stand Up Guys offer Junk Bucket Dumpsters all over. 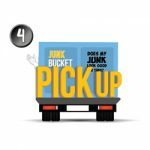 So if you live anywhere in the Metro Atlanta area of Georgia, or the surrounding cities, then the Junk Bucket comes to your. Also, if you live in the Tampa Bay Area in Florida, or any of the surrounding cities, The Junk Bucket comes to you!